Nifty ended the week on negative note losing around 2.20%. As we have mentioned last week that minor resistance for the index lies in the zone of 8680 to 8720. Resistance for the index lies in the zone of 8810 to 8850 levels from where the index has broken down. 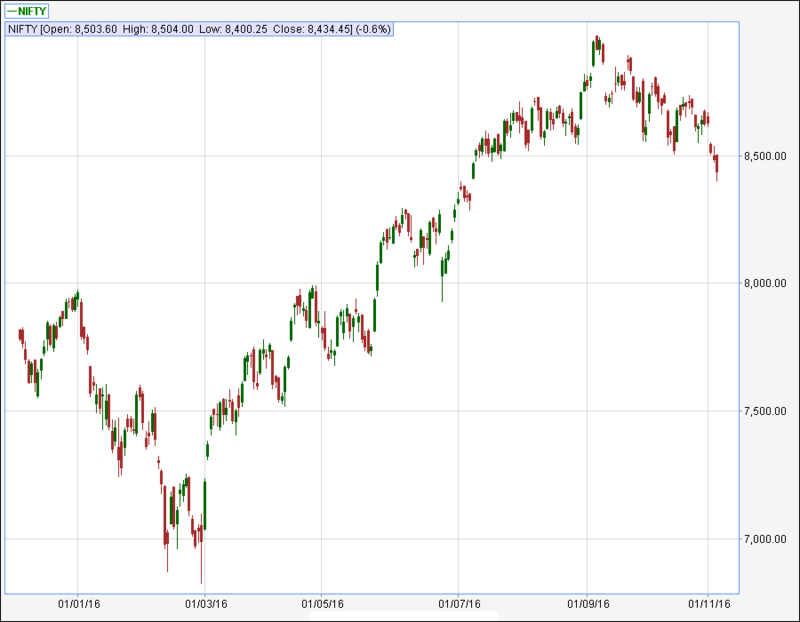 If the index closes above these levels then the index can move to the levels of 8900 to 8950 where the index has made a top in the month of September – 2016. During the week the index manages to hit a high of 8670 and close the week around the levels of 8434. The index has broken the trend-line joining the lows of March, April, May & June also coincides with the support zone of 8500 to 8550. Support for the index lies in the zone of 8350 to 8400 where the index has formed a gap on 11/07/2016. If the index breaks below these levels on closing basis then the index can drift to the levels of 8000 to 8100 levels where long term moving averages are lying. It seems the index has formed a H & S pattern where neckline lies around the levels of 8500 to 8550. If the index has broken this pattern then the target for this can be in the range of 8100. The coming week can be highly volatile for global markets as Unites States is going for elections. Broad range for the week is seen from 8100 on downside to 8700 on upside.